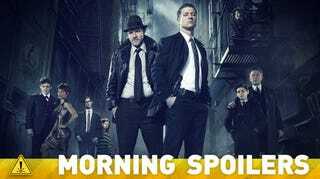 Will Gotham's Next Supervillain Arc Feature The Riddler? Emily Blunt explains why Into the Woods was changed from stage to screen. James Gunn gives the definitive answer about a Guardians of the Galaxy/Avengers crossover. The Walking Dead spinoff gets its female lead. And are we close to seeing an Ant-Man trailer? Spoilers now! It was as detailed as I usually do it. I did a lot of thinking and a lot of delving. It's kind of a hard thing to talk about, the process and how you get there. It just kind of sounds a bit stupid. (laughs) I always try to make a life for a person. Who were they before this moment that you meet them? What were they like? What do they feel like in your skin? All of that stuff. I think that it is important to build a history for them so that they feel alive and complex and relatable. It was wonderful getting to play with James [Corden] because we actually have known each other for years. We have quite a shorthand and he's so talented comedically that he's just great fun to spar with in these scenes. I knew we'd have the right kind of energy for this couple that has become a bit stagnant and are probably rather sick of each other. Then again, they also love each other and that big number we have, the duet, is about the love between these two people who have been together for so long. They've sort of lost their way and you see them fall in love again. It was really magic. Rob Marshall and I talked about it and we decided that she's this midwestern housewife who has never left her little town and reads US Weekly every week. Suddenly there's George Clooney right in front of her saying, "Do you want to make out?" What would she do? How would she respond? What do we believe? I just think she's obsessed with the Prince. She just thinks he's God's gift to women. She can't believe she's meeting him and then he does meet with him and he wants to make out with her. What happens? Does that fluster you? Does that excite you? Does it do both? We sort of went with that. It was so much fun to work with Chris Pine, who just reveled in playing this superficial, douchey, egotistical guy. I had a really hard time not laughing playing scenes with him. Blunt: I do hear [that I'm a fan favorite], but only from you guys! I haven't been given an official offer, but it's still very flattering. I don't even know what it is. CS: You need to read more comic books! Blunt: I know! I just don't have the time. But I'll be interested if it happens. But nothing, nothing, has been offered to me. I have not received a phone call. Woke up the other day to two articles - one that announced I said the Avengers and the Guardians were never teaming up, another that said I said they were. These two articles were based ON THE SAME INTERVIEW (the podcast with Jeff Goldsmith). The truth is, I never said either of those things. I'm not going to tell anyone what happens to the Guardians, especially two or three movies down when who even knows if I'll be around anymore. Whatever the case, there's been a lot of anger around me - at me, from people defending me at others, and so on. And it's all people who love Marvel, like me, and just want to see awesome and amazing and moving stories. There are many more important things going on in the world right now, but this is clogging up my feed, so let me do my best to set the record straight. Perhaps sometimes I say things imperfectly, unclearly, or inelegantly. All I've ever tried to say was the Guardians are an important part of the MCU, and they definitely share an existence with the Avengers and other characters in the MCU. But the week after the movie opened I walked into the Marvel offices, and I sat down with Kevin Feige and some of the other folks at Marvel. We had a long discussion about where the Guardians were headed and what was happening to them. I told them exactly what I wanted to do with the sequel to Guardians, and everyone was on board and excited. And, regarding the bigger picture, we all agreed on one thing, and that was to keep huge chunks of the Guardians separate from the Marvel heroes of earth, because they have a whole galaxy to explore. We wanted to use them as a way to make the MCU bigger, not smaller. We wanted to make sure they have their own mythos, as opposed to only one that is intertwined with the earthbound characters. They ARE connected, of course, but that connection would not be the purpose of their stories and fictional lives. When I'm asked about the Guardians and their future, and whether they'll meet up with the Avengers I really don't have all that much to say, because some of it isn't decided yet, and I don't want to give away what is decided. So I speak in these general terms. They aren't things that I'm just saying on the spot, and they aren't things that have been decided on by me alone. But they are sometimes incredibly general, and that can lead to those words being taken in a lot of different ways. So, I'm sorry for all the different ways my words have been taken. Overall, we'll just have to wait and see where the Guardians go, who they meet, and what they do in the MCU. But know that I love them and will take the best care of them I possibly can for as long as I'm around. MORE IMPORTANTLY, I'm getting a lot of questions about the AA batteries in Quill's Walkman, and how Quill's Walkman can survive for so long. Significantly. And I'm very happy about that. [The producers have suggested] that every season is going to focus on a villain, and presumably in the order in which we're introduced, and the significance with which we're introduced in the pilot. So right now, as an actor, I want to start as far away from the Riddler as possible. That's the most exciting to me. Right now, I am a forensic scientist with the Gotham City police department, with full, honest, pure, positive intentions of contributing in a productive way, being a good citizen. I have a mathematical, scientific mind. So this is the perfect job for me. I love my job, I'm passionate about it, I'm an enthusiastic guy, I love my work. And so I'm starting in the most genuine, happy way. I'm sharing riddles and puzzles and I communicate in answers and questions because that is my home base, that's my comfortable spot to be in. And what you're seeing in the very beginning are the seeds of mistreatment from the people I communicate with, aka Harvey Bullock [played by Donal Logue], and you're seeing James Gordon as someone who answers my riddle in the pilot. So there's this instantaneous connection of, I pinpoint him as someone that interests me. Because he solved my riddle, which is awesome, but Harvey Bullock is going to continue to mistreat me, Captain Sarah Essen [played by Zabrina Guevara], similarly. And that's going to start to grate. But it's going to be a very slow, slow burn. Yeah. What [series developer/executive producer] Bruno Heller and I are trying to do is create a person whose comfort zone is science, math, numbers, puzzles, riddles, question/answer, a bit socially inept. He's socially unconventional. When he's in a room, he's not necessarily aware of what's going on, of people's emotions, of what is normal. The midseason opener has a scene for Felicity that Emily Bett Rickards described as "sad" and that left her feeling "drained." As for Diggle, executive producer Marc Guggenheim said that the same episode has a scene with David Ramsey, who "shot what I would describe as his most emotional scene…. David breaks your heart with his performance." What we've been trying to do with this show—with the flashbacks and mythology—is really distinguish it from a lot of those procedurals where they solve a crime each week, and it's, 'Are they going to kiss or aren't they going to kiss?'" Miller says. "Nothing against those shows; this is just built a little bit differently. Whether Henry and Jo get together, or whether it's an emotional connection, obviously it's something that's out there and something we will explore. Once you see them lean in for a kiss, it's hard to pull back from that again. We want to wait until it feels organic for us and it feels like the right timing in terms of the stories that we want to tell for these characters. That's a very good question! It will be interesting to find out what that period of time was and why they were apart. Was it to protect Abe? Was it to protect the secret or something like that? It will be interesting.